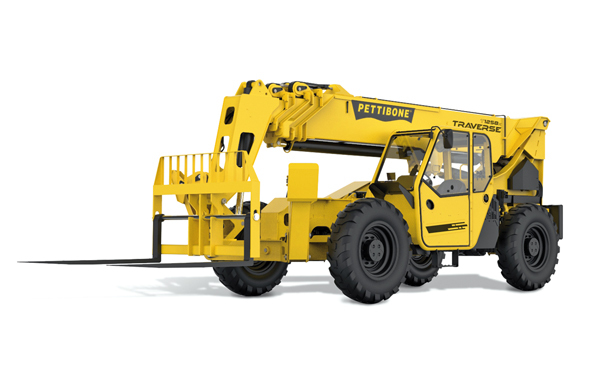 Marking its entry into the 5,443 kg capacity market, Pettibone introduces the Traverse T1258X telehandler. The new Traverse model becomes part of the industry’s only new telehandler product line with a traversing boom carriage that can move loads by traveling horizontally. By providing up to 1.78 m of horizontal boom transfer, the Traverse allows operators to safely place loads at full lift height without needing to coordinate multiple boom functions. The T1258X has a specified lift height of 17.83 m and its landing height is identical. By contrast, traditional fixed boom pivots typically have a true landing height that is less than the promoted lift height, as users must account for a withdrawing the forks out of the load with enough rearward travel for the fork tips to clear the landing zone. The traversing boom allows for maximum forward reach of 14.58 m.
The new telehandler is powered by a 117-hp Cummins QSF 3.8 Tier 4 final diesel engine that helps the machine achieve its maximum load capacity of 5,443 kg. The engine is mounted on a side pod for easy service access while allowing excellent curbside visibility and ground clearance of 48 cm. Built for use on rough terrain, the unit offers full-time 4-wheel-drive with limited-slip front axle differential. Tight steer angle capability provides an efficient turning radius of 4.37 m. The Dana VDT12000 Powershift transmission offers 3 speeds, forward and reverse. The operator cab maintains Pettibone’s ergonomic seat, pedal, joystick and steering wheel positions. An analog/LCD gauge cluster comes standard. An optional 7” digital display with integrated back-up camera is also available.